Yarn: Jaeger Baby Merino 4ply, that we got while we were on holiday earlier in the year. I had 4 balls, and used about 3 1/2 in total. Notes: I cut the width of the stole down by two repeats, which worked out well mathematically, and meant there wasn’t really any serious fudging to do. It was exactly the knit I needed – always interesting, and with lots of mid-points to aim for, which is probably why it knit up so quickly. The stole is lovely and the lace is shown off really well in that wool. I’m sure your mum will love it! 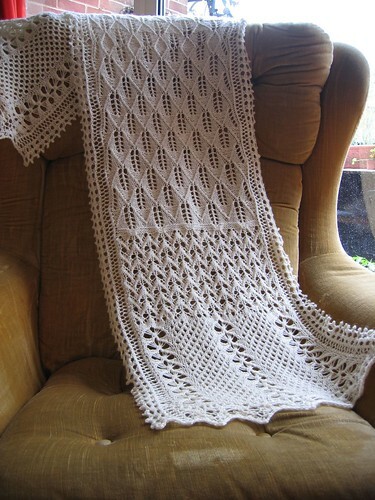 I like knitting patterns like that, where there are different lace patterns to keep you interested. That is a beautiful scarf, I am sure your Mum will be thrilled! I hope you are really pleased with it. Came here after looking at your Faroese-shaped Barbara shawl on Ravelry. Both of these are so lovely! Wow that is really beautiful. I’d like to make this stole one day.